Drawn on amate fig tree bark paper, the ‘Codex Tepotzotlan I’ is now on display in the Ulster Museum, Belfast (it was gifted there in 1833); its twin, ‘Codex Tepotzotlan II’ (on European paper) is held by the Archivo General de la Nación in Mexico City. The three towns in question are Xoloc (San Mateo), Cuauhtlapan (Santiago) and Tepoxaco (San Francisco). 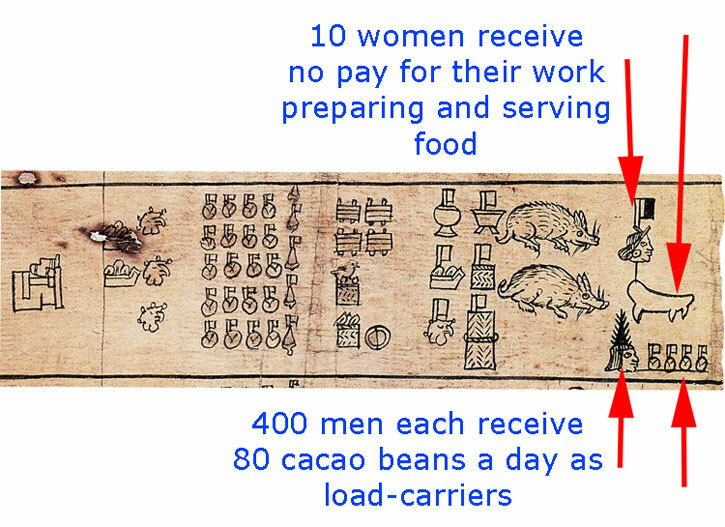 The first half of Codex T1 (main picture) shows the wards of Xoloc town, the second of which - indicated, reading L to R - is Miccacalco, the charnel house (where human skeletal remains are stored - note the little mummy bundle at the front of the temple glyph, pic 1). 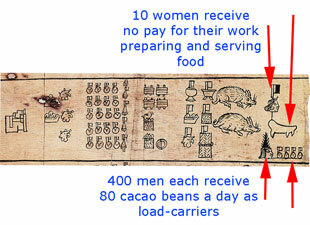 • Finally, we see the remuneration (or lack of it) given daily to men and women of the community: 400 men (‘400’ is indicated by the plume over the man’s head) each receive daily 80 cacao beans (arrowed, bottom right) as load carriers (each tiny flag indicates ‘20’); the 10 (half of a ‘20’-flag or banner) women receive no payment at all for their grinding away all day on the large stone quern or metate (arrowed, top right). Source of info and images: Painted Books from Mexico by Gordon Brotherston (British Museum Press, 1995); with additional info from Elizabeth Baquedano. Graphics added by Mexicolore. Talk about paying tribute to women’s labour!